This week, Trinity Mirror bought GMG Regional Media in a deal that will completely reshape the Manchester media landscape. For a total consideration of £44.8 million, the publishing giant acquires 32 local newspapers from the Guardian Media Group including the Manchester Evening News and websites like ManchesterEveningNews.co.uk. The buyout is expected to be completed on March 28th 2010. Commenting on the deal, Trinity Mirror chief executive Sly Bailey said: "GMG Regional Media is a perfect strategic fit for our group. This acquisition, which includes the Manchester Evening News with its rich journalistic heritage, together with the weekly titles and associated websites, extends our reach across print and online, and is a further step towards our strategic goal of creating a multimedia business of real scale." Of course, a true "multimedia business" is about so much more than just print. Growing numbers of readers are getting local news from websites – and social media tools like Twitter are proving important traffic generators. That's why I thought it would be interesting to compare the Twitter accounts of LiverpoolEcho.co.uk, Trinity Mirror's flagship newspaper site in the north west, and new addition ManchesterEveningNews.co.uk. 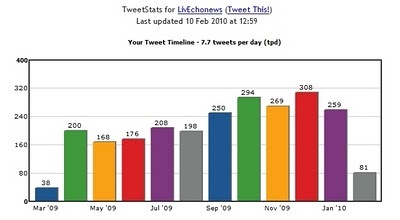 @LivEchonews has a clear lead over @MENnewsdesk in terms of followers (2,545 versus 1,677). It also tweets far more frequently (according to Twitter analytics service TweetStats, 7.7 times per day versus just 3). 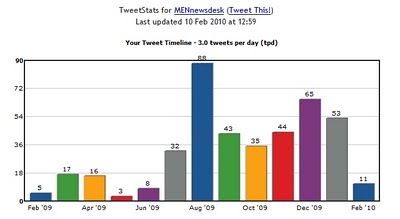 And it's consistent (as you can see below, @LivEchonews has tweeted between 150 and 350 times per month since April 2009 whereas @MENnewsdesk has fluctuated wildly from 3 times to 88 times per month). So in terms of the main news feed on Twitter, LiverpoolEcho.co.uk wins. 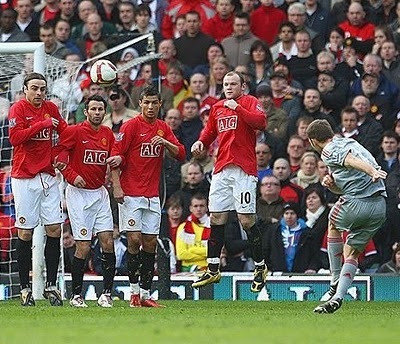 @LivEchoLFC has a huge presence on Twitter with 2,264 followers, while LivEchoEFC has 520 followers. Compare that to @ManUtdMEN with a measly 277 followers or @ManCityMEN with 455 followers. However, we should point out that publishing frequency is remarkably similar across all four accounts with between 3.5 and 4.5 tweets per day. So in terms of the main sports feeds on Twitter, LiverpoolEcho.co.uk wins. Despite my best efforts, I have been unable to find any Twitter account for Liverpool Echo chief reporter Michelle Fiddler. 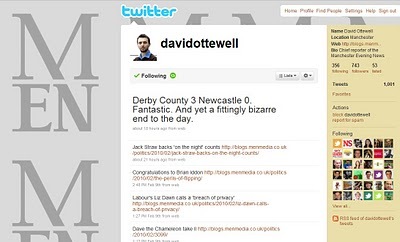 By contrast, Manchester Evening News chief reporter David Ottewell has a hefty profile with 743 followers and an impressive tweet ratio of 6.4 times per day. While several Liverpool Echo reporters maintain their own Twitter accounts, it seems Michelle Fiddler is not one of them. So in terms of the chief reporter feed on Twitter, ManchesterEveningNews.co.uk wins. LiverpoolEcho.co.uk is clearly well ahead of ManchesterEveningNews.co.uk when it comes to Twitter. Its main news feed has more followers, tweets more regularly and is more consistent than its Manchester counterpart. Similarly, its main sports feeds enjoy much larger audiences (unless Liverpool FC really has 10 times more fans than Manchester United!). One major surprise is that the Liverpool Echo's chief reporter has no Twitter presence whatsoever. But on the whole, LiverpoolEcho.co.uk has a much bigger profile despite the fact that Liverpool is a smaller city with fewer Twitter users than Manchester. Consequently, Trinity Mirror may need to revamp the ManchesterEveningNews.co.uk Twitter accounts if it wants to capitalise on the growing number of referrals from the site.